This is one of the most famous of Scottish clan surnames. It originates from the Barony of Urquhart on Loch Ness in Invernesshire, and as such the clan have always been geographically centrally placed to influence the course of 'Highland' history. The early history of the clan is shrouded in mystery, but it would seem that they held the hereditary position of the Sheriffdom of Cromarty throughout the medieval period. The local dialectal pronunciation of the name is 'Orchar or Urchar' which in the gaelic would imply a spear or stone thrower, an early warrior perhaps? Certainly the Urquharts have never been far from the action, even as recently as 1944 when Brigadier General Urquhart lead the Airborn Division in the famous Second World War battle of Arnhem. Perhaps not surprisingly the surname has been recorded in many spellings and these include Urcharde (1455), Vrquhat (1544), and even Wrwhart in 1662. The coat of arms granted to the chief of the clan and dating from the time of Robert The Bruce has the blazon of a gold field, charged with three red boars heads erased, armed blue. The 'boars head' implies exceptional ferocity in the face of the enemy. 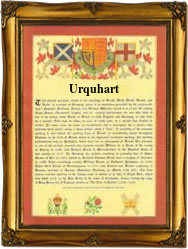 The Urquharts also have a holding in Ireland, being recorded at Castle Pollard, County Westmeath. The first recorded spelling of the family name is shown to be that of William de Urchard, which was dated 1310, High Sheriff of Crombathie, during the reign of King Robert the Bruce of Scotland, 1306 - 1329. Surnames became necessary when governments introduced personal taxation. In England this was known as Poll Tax. Throughout the centuries, surnames in every country have continued to "develop" often leading to astonishing variants of the original spelling.